Are Social Sharing Buttons Always Good To Include In Web Pages? Page loading time is a major factor that should be taken into consideration since it forces users to either stay or bounce from your website. Web visitors expect your page to respond in 2 seconds or less, otherwise they will leave your website when it takes 3 minutes or more, according to a survey conducted by Akamai and Forrester research. In additon, page loading time might also affect your website SEO ranking. Increase visitors confusion: There are many different goals you need to achieve when directing your user to a landing page. For example, if one of these objectives is to encourage your visitor to make a purchase and proceed a check out, social sharing buttons do not make sense in such a case because they confuse your users of what they were mainly looking for, consequently, they might forget their actual demand which is buying your product. 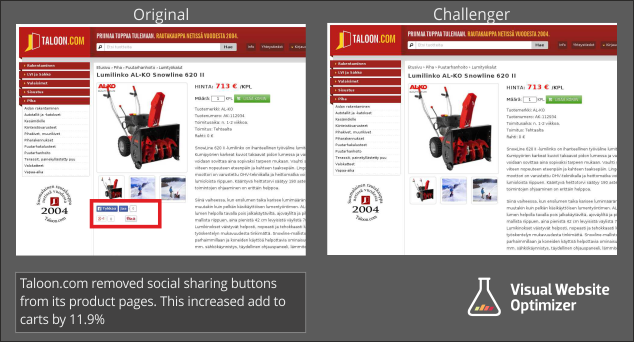 Taloon, a Finland based hardware ecommerce store, had removed Facebook and Pinterest icons located in the original page, leading to a better conversion in the challenger page. Taloon has realized that the presence of social icons were distracting their customers from their major goal. In summary, it is critical to figure out that not all the time, social sharing buttons lead to a greater conversion rate or boost your number of fans. Ultimately, it depends on the outcome you are willing to reach. For example if positioning social buttons is among your plans, and the outcome your are willing to reach goes in line with your plans, go for it. However if your objective is positioned toward an opposite direction you have to consider revising your plans and make the required edits.